Millennials are often called selfish and lazy. We rather call it: ‘technologically advanced.’ Why wait if there is a faster way to get what you are looking for: an answer. If your hotel front desk can respond quickly in the way these guests prefer, you grab the opportunity to build something great: a mobile relationship. Making a phone call is getting ‘old style’ in the digital world of Millennials. This #hashtag generation uses other ways to connect; first they check if their contact is online on a social channel. If they’re not, they send a text message or WhatsApp. Making a phone call is only happening in the worst case scenario, and that most likely will be Skype or Facetime. This ongoing ‘digitalisation in communication’, is about to happen when Millennials talk to your hotel. Millenials, born and raised after 1981 and living a digital and mobile life, will not easily call you. It takes too much effort and time to explain that they’re looking for a weekend promotion they can’t find on your website. Sending an e-mail is another long way to get an answer; all they want is a personal and instant reply. We know your hotel front desk is already overwhelmed by e-mails from suppliers, credit card companies and travel agents. And so the digital individual will have to wait before you found time to give them a reply. With WhatsApp, you improve this process very simple. And there’s a lot more for you to win in terms of faster communication and fewer e-mails. Sounds interesting? Many companies like airlines or after sales services use Twitter to give customer service. It’s fast and modern. The downside is the outside world sees all tweets. Everybody can read them, and some people are cruel enough to retweet only the complaints. If you don’t have the time to monitor every Tweet with your #hotelname in it, we suggest using WhatsApp. It’s faster, more private and a great personal way to communicate. You can respond to your guests in real-time and send longer messages than the 140 characters Twitter offers. Use WhatsApp to share your news (text, video, podcast, promotion, booking links) and communicate these directly on the mobile phone of your guest. If they like your information, it’s easily shared with a friend. The trend of ‘experiental travel’ is on the rise. And so is the way to create and communicate your new promotional packages. With ranking content about your packages, you attract more direct visitors on the website. Once they are there and overwhelmed by the design, the tone of voice and great images on your website, you expect them to send you an email. Or book straight away. But that doesn’t happen because they still have some questions. Front desk managers should open up this new channel to receive requests from the next generation. Millennials know they can book a hotel room via any OTA. But what they search for is an experience in your town. And that’s something only you can sell as a package deal. Making contact through a form or a phone call is for Millennials “sooo 2005”. They want to send you a WhatsApp with questions about a a package deal, group booking, a room or special dinner requests. With a Whatsapp logo and a mobile number on your website frontpage, you demonstrate you’re living in a digital world and use technology used by modern people. WhatsApp does not cost anything and it instantly powers up your brand image. You download and install the App on a mobile phone or tablet, enter a Sim card and mobile number, confirm the activation code and that’s it. Connect to your Wifi network to save data cost. You can spice up your profile with a picture and a description. Within five minutes you’ve activated a new channel to make contact with the digital generation. Once the buzz starts, you’ll see more guests start to communicate with you via WhatsApp. Just don’t answer a phone call on that number; block all incoming calls. WhatsApp is great to communicate 1:1 and to create groups for your guests and your staff. Once you have made mobile contact with your customer, you can add their WhatApp name and number to a group. If they wanted info about a short weekend break, add them to your Weekend Break group. It’s important you gain as much data about your guests as you can. Use WhatsApp to send something nice about your hotel weekend promotion, plus a link to book directly on your website. Don’t do this too often; be reasonable, once a three to five months is enough. Unless they asked to receive monthly news about your hotel. In that case you send them an update about the local news in your digital community. It’s fun and rewarding: with digital media you connect everything with everybody in a fast and very personal way. If your hotel organizes events, a WhatsApp Group is a great way to keep all people involved up to date about the event. Once you have the phone number of all attendees, invite them to install the free WhatsApp on their mobile phone. When everybody is online, invite them to the special group you’ve created for that event. Send updates like video, pictures and instructions about your event to keep everybody ‘on the same page’ with one single message. You can use WhatsApp also for team announcements. Open a Group for all Front desk managers, as an alternative to long email chains. Share important information and updates with other team members faster than ever before. You can even see if they saw your message. 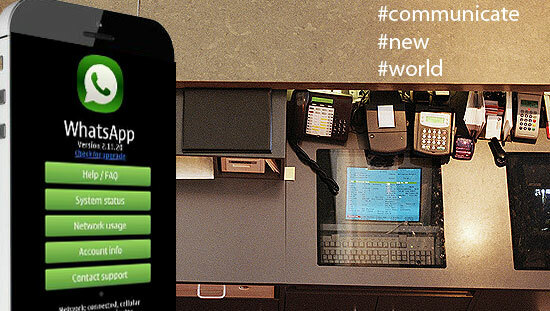 Share the post "Empower your Hotel with WhatsApp."